HOW IS THIS DIFFERENT FROM YOUR REGULAR ESCAPE ROOM GAMES? Bring the Breakout experience with you! Plan, solve, and enjoy anywhere--even in the comfort of your own home! It is a step apart from everyday entertainment. Better than a book and more engaging than television, this new and exciting immersive experience will surely get you addicted and may even keep you up at night. Breakout Takeout is a take-anywhere puzzle pack with themes that revolve around the storylines of various Breakout Escape Rooms. Whether you do it alone or with a group, Breakout Takeout will give you a background to the story of a room you are curious about or let you dig deeper into the world and secrets of your favorite room. Choose from among the wide selection of Breakout themes. Each box will serve as a prequel or sequel to our Escape Rooms, or as a special (and harder) stand-alone mission. Inside the boxes are physical clues and puzzles that you will go through. These puzzles will definitely be interactive and will even lead you to the web and back to the real world! Our experiences are designed to keep you up at night. Some may take this as a challenge to solve by themselves, while others might pair up and use this as their next date night adventure! Haven’t found your forever yet? You can also gather your squad and multiply the brain power. Solving with your friends will make for a memorable game night! The games are designed so that you can play wherever you go! Explore different scenarios with well-crafted storylines full of unexpected twists and turns. Some parts of the game though may occasionally require internet connection through computer or your smartphone. But treat this as a small price to pay for an immersive puzzle solving adventure! You are part of a secret government agency identified as Maghirang and are called to do confidential missions to save our country. Don't let us down, agent! Warning: This is one of our harder series! This story is about how the Outbreak spread across the world and gives you an idea of who the owner of that cabin in the woods you find while running away from zombies is. This story revolves around the history of the science experiments that allows the volunteer to flatline and venture into the unknown. What happens over there and do you come back the same? Or does something or someone go back with you? This story reveals what happened to the lovely couple that caused them to be the center of all this attention. Could all these horrible stories actually be the greatest love story ever told? This special edition is not connected to any of our rooms… but instead is designed to be even more frustrating and challenging than the #breakoutonlinechallenge we post on our social media pages. Those challenges consist of 3 to 4 puzzles. In this upcoming edition, there will be 50+ puzzles ready to be the cause of sleepless nights. The game begins on January 30, 2019. **Our Breakout Takeout Living Legends Edition are P1999 per box. The packages above do not include this special edition and only applies to our other regular Breakout Takeout Boxes. Breakout Takeout is now available across our 6 branches! Simply choose among our 2 packages and our supervisors will assist you in bringing the Breakout Experience home with you! For a minimal shipping fee, enjoy the convenience of having a Breakout Takeout pack delivered to you. Email us at support@breakout.com.ph of which package you want to avail and we will give you details on how to proceed with this method. Receive a highly addictive detective game with themes that revolve around the storylines of various Breakout Escape Rooms. Whether you do it alone or with a group, Breakout Takeout will give you a background to the story of a room you are curious about or let you dig deeper into the world and secrets of your favorite room. Receive packages filled with objects, clues, and puzzles that draw you into an interactive experience. Get ready for maps, encoded letters, encrypted flash drives, forensic evidence, photographs, and many more! Be prepared to start tacking papers to your wall and connecting the dots with string as you can expect to discover loose connections and decipher hidden messages. More than analyzing the contents of your packages, your investigation will lead you to even deeper storylines and clues on the internet. Discover hidden websites, email addresses and interact with characters ONLINE and THROUGH EMAIL. Our experiences are designed to keep you up at night. Some may take this as a challenge to solve by themselves, while others might pair up and use this as their next date night adventure! Haven’t found your forever yet? You can also gather your squad and multiply the brain power. Solving with your friends will make for a memorable game night! This is a special edition where we take a break from being story driven and challenge you in this 50+ Puzzle Challenge designed to frustrate and challenge even the best out there. We will reward with special prizes ANYONE (even the 100th finisher) who can solve all the puzzles. Do you think you have what it takes? 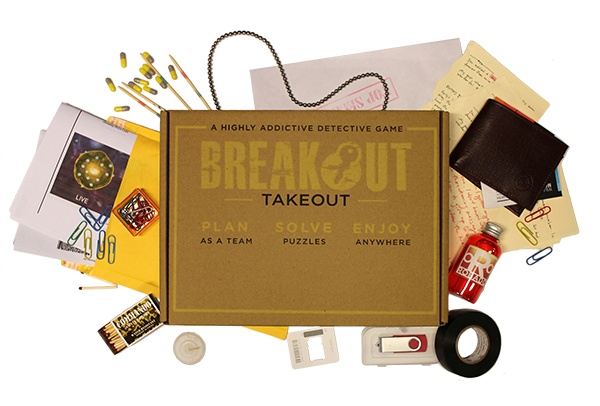 I want a Breakout Takeout Box! How much does it cost? For a limited time, enjoy a sale where you can buy 4 boxes (not including the Living Legends Edition) for only P2000. Our original boxes per piece are P999 and our special Living Legends Edition is P1999. This one is different from the other editions as it is not story driven and contains a whole lot more puzzles earning it a 10 out of 5 difficulty level. Can I order a Breakout Takeout Box even without going to a branch? How much will it cost? Yes, we will be glad to send it your way! For a minimal fee, enjoy the convenience of having a Breakout Takeout box delivered to you. Email us at support@breakout.com.ph of which package you want to avail and we will give you details on how to proceed with this method. Is it worth it? Should I play your Escape Room Game instead? Obviously nothing compares to the live immersive experience in our rooms. However, Breakout Takeout allows you to bring the experience wherever you go and actually helps continue the story of the crazy worlds in our rooms that we have built. Plus for just the same price as three large cups of coffee, you can plan, solve, and enjoy Breakout Takeout packs with an unlimited number of friends. What do you mean it continues the story of the rooms? Breakout Takeout revolve around the storylines of various Breakout Escape Rooms. It will give you a background to the story of a room you are curious about (PREQUELS) or let you dig deeper into the world and secrets of your favorite room (SEQUELS). Do I have to buy a Breakout Takeout box before or after I play a Breakout escape room? The themes of the Breakout Takeout packs revolve around the Breakout escape rooms but they may be equally enjoyed without playing an escape room. But if you successfully solve the puzzle, we wouldn’t be surprised if you’d like to sign up for an actual room! Are the Breakout Takeout puzzles connected and must I do all? Each puzzle pack can be enjoyed without any having a background knowledge of the corresponding Breakout escape room or the other Breakout Takeout packs. However, all of our experiences are set in the same "shared universe" which may allow players to encounter the same characters, locations, and storylines in certain packs. The more puzzles you solve, the more fun it will be to discover overlapping themes that may paint a bigger picture for you.